More than 325 mil- lion gallons of deadly cyanide waste spilled recent- ly into the Essequibo, central Guyana's biggest river, killing thousands of fish and forcing the government to adopt emergency measures. 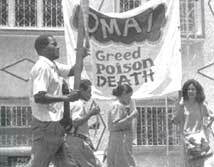 The spill's origin has been traced to the Omai open pit gold mine operated by Canadian firms; cyanide is used in treating the ore.
People living along the banks of the Essequibo, who include some 18,000 Indians, loggers and miners, are being told not to use the river's waters. President Cheddi Jagan has promised a com- plete reexamination of the country's environmental laws in the wake of the "disaster". Cambior, the Canadian firm which owns 65 per cent of the mine, has flown in its engineers and technicians to help stem the flow of the waste into the river. The lat- est spill follows a smaller leak in May, which had affected the Omai river.